My Run: Overall, the Medtronic Twin Cities Marathon (MTC) was my fifth full marathon, and my first since the Country Music Marathon in April 2010. All five of my marathons have been within the past 12 months, with the 2009 Chicago Marathon being my first. In the first four marathons, I set PRs in 3 of them, improving from 3:53 in Chicago (10/09) to 3:39 in Knoxville (03/10). Even though I was steadily improving, I knew I needed a better cross training program if I was truly going to take my running to the next level and ultimately qualify for Boston. With that in mind, I started P90X in June after doing a lot of research into cross training programs. Even with the improved training I knew that closing a 24-minute gap to qualify for Boston by the MTC in October would be exceptionally difficult. Throughout my training this summer I began to see steady improvement, and as of August began to think about setting 3:30 as a goal for the MTC depending on the race day conditions. However, when I stated this goal to someone in our running group, their response back was “You’re faster than that! You should be going for 3:15!” This was both encouraging and terrifying at the same time. As August moved into September, our group did a couple of marathon pace indicator workouts, and things seemed to be pointing in the direction of being capable of doing a 3:15. With this in mind, I started increasing the speed of my tempo runs. My first attempt at a 10-mile tempo run at 3:15 marathon pace was a bust. I only lasted through 7-miles. However, my next attempt of 11-miles was very successful. After discussing this with several members of our running group, I decided to go for it at MTC provided that weather conditions were favorable. When I woke up on race-day morning, it was 39 degrees, and the highs during the race were only supposed to reach the low 50s. Perfect conditions! Unfortunately, there was not a 3:15 pace group, only a 3:10 or 3:20. At the advice of several from my group, my goal was to run even splits as much as possible, and not try to bank any time. From their experience, they indicated I would need all of the stamina I could get for the hills beginning at mile 20. Kate Agee – TC Kid’s Marathon Finisher! Better muscle balance – My running muscles were very strong, but the opposing muscles were very weak. This was especially true in my glutes, hamstrings & hips. Poor muscle balance greatly increases the risk of injury while running. Also, I have been notoriously weak when running hills, and my hope was that this program would improve the consistency of my running when facing a hilly course. Improved core strength – On long runs (15+ miles), I could really tell that my core was weak. My posture would begin to fail and my lower abs would be very sore after the run. Improved flexibility – Again, having poor flexibility greatly increases the risk of injury, and I was about as flexible as a steel pipe. Higher anaerobic threshold – I had been doing weekly track workouts for about the last 6 months, but wanted to add some additional anaerobic interval workouts to my routine to try and push this threshold even higher. We began the program in June 2010, after doing a lot of research into various home fitness routines. We additionally followed the general guidelines of the nutrition plan, and used a Weight Watchers maintenance plan to help with knowing how many calories to consume daily. It was tough to maintain the 6-day a week P90X schedule while running 40 to 50 miles per week, but it has been a blast seeing the results. I’m thankful that my wife agreed to try it with me, though I’m not sure she knew exactly what she was getting herself into 🙂 Her before and after results with the “Fit Test” were very impressive (see below), and I’m proud of her for sticking with it. She is also entered in 3 races this fall and winter (half marathons), and I’m confident she will see significant gains in race performance. I’ll probably do another post at some point to review the program itself, so I’ll not go through all of the routines. However, my overall review is that this program is excellent and really does work. Anyone who dismisses it simply because it is typically promoted through infomercials, is really missing out on a fantastic routine. It has a great mix of resistance, cardio, and flexibility training. While all of these improvements can’t be solely attributed to P90X, it has no doubt helped a significant amount. The comparison is year over year to try and see stats in similar running conditions. Well….the real test of the results will be at the Twin Cities Marathon on October 3, 2010. My current marathon PR is 3:39, and I’m hoping to significantly improve upon this finish time. Anyone else have a positive experience with P90X they want to share? I would especially love to hear from anyone who has gone through the program to improve their running performance. My Run: Overall, the One America 500 Festival Mini-Marathon (Mini) in Indianapolis was my fifth half marathon, and my third long-distance race in the last six weeks (Covenant Health Knoxville Marathon on 03/28 & Country Music Marathon on 04/24). This was the second year in a row that I have run the Mini, which is the largest half marathon and fifth largest road race in the U.S. with 35,000 runners. The Mini is part of the month-long 500 Festival that leads up to the Indianapolis 500. I traveled to Indianapolis with my good friend Nathan Wright. When Nathan is in top form, he has proven to have a little more speed than me (sub 1:40 PR for the half, compared to my 1:44 PR). However, Nathan had not run a long distance event since the 2009 Country Music Half Marathon, and had only begun running again in February of this year after dealing with a foot injury. Prior to the race we had discussed shooting for an 8:00 min per mile pace through the first 9 or 10 miles, and then each of us would decide how much gas we had left for the finish. If we carried that pace to the end, we would finish in 1:45. Our plan was to start out conservatively (which is a must due to crowd congestion), and then pick it up slowly over the course of the race. The weather was a mixture of good and bad. It was an overcast day, and temperatures were ideal, with upper 40s at the start and mid 50s at the finish. However, the wind was blowing around 20 mph with gusts up to 30 mph. Given that Indianapolis is very flat, the terrain offered little protection. This was slightly concerning as the wind blew my hat down the street while Nathan and I were running our warmup stride-outs. 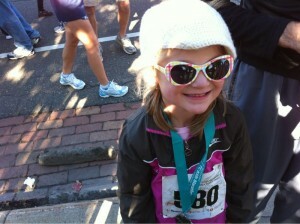 Sara – Another Agee Runner in the Making! My Run: Overall, the Country Music Marathon (CMM) was my fourth full marathon, and my second in the last four weeks (Covenant Health Knoxville Marathon on 03/28). In Knoxville, I set a new PR of 3:39, and in the back of my mind hoped that I could improve on that time at the CMM. I really like running with pace groups, and at the CMM, the pace groups are set every 15 minutes. It took me a while to decide whether I would run with the 3:45 group, and attempt to pick it up at the end, or try to hang with the 3:30 group. I ultimately decided to go with the 3:30 group which turned out to be a poor decision considering the conditions on race day. All week, the forecast had called for severe storms on Saturday, and ultimately the race organizers decided to cut off the full marathon after 4:30. The prediction was for a first wave of storms that would clear out around 6am, and then a second wave would move in around mid-day. This is pretty close to how it turned out, but what I didn’t expect was that during this gap there would be warm, sunny, and humid conditions. I was able to hang with the 3:30 pace group through the first 11 miles or so, but the heat and humidity took a big toll. Between miles 11 and 12 I hit the wall very hard (bonked). My heart rate was in the mid 180s, which is much higher than I am used to after coming through the winter months. I had to walk for a bit to try and lower my heart rate, and began dumping cold water over my head. I began to think that finishing the race was going to be extremely difficult. Once I reached the second half of the course, I was able to regain some semblance of a running rhythm, and made the decision that I was going to walk for a couple of minutes at every aid station, and simply focus on finishing. 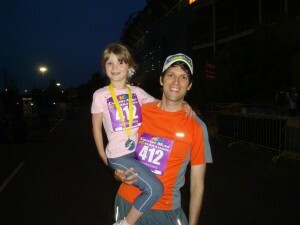 Really proud of Kate for finishing the Country Music Kid’s Marathon tonight! Really proud of Kate for finishing the Country Music Kid’s Marathon tonight! She completed 25+ miles over the past 4 weeks, and ran hard the whole way tonight. 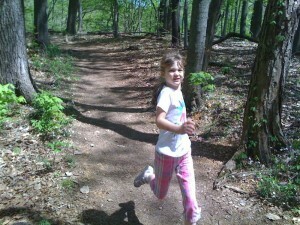 My daughter Kate getting in some miles for the Country Music Kids Marathon on the trails at Percy Warner Park! 2010 Fall Marathon – Plan B?? Well, I found out today that I was not selected in the lottery for the 2010 New York City Marathon. I’m disappointed, but still want to compete in one or maybe two fall marathons. I would really like for one of these marathons to either be a big event, or a great destination (or both). My fallback plan was originally to go to Chicago, but it filled up back in March. My running group is headed to the Marine Corps Marathon in Washington D.C, but this race falls on Halloween in 2010, and I really don’t want to miss this with my kids. Now I’m strongly considering the Medtronic Twin Cities Marathon in Minneapolis in early October. Anybody else have any suggestions for the fall? Anybody want to join me at Twin Cities? Now that I’m hopelessly addicted to running Marathons (have finished Chicago, St. Jude & Knoxville), I’ve started compiling a list of races that I want to finish before I leave this earth…. Boston – My goal is to qualify before my 40th birthday (I’m 35). To do that I will have to run a 3:15, which is 24 minutes faster than my PR. New York – As the intro to Letterman says – “The greatest city in the world!” NYC is my favorite place on earth, and I can’t wait to run this marathon. All 5 boroughs, 2 Million+ spectators, 44K+ runners!! I’m in the lottery for 2010, and will find out on April 7th. Big Sur (Monterey, CA) – 26.2 + The Monterey Coast = WOW! Might have to combine with a trip to play Pebble Beach. St George (Utah) – 5240’ at the start and 2600’ at the finish, running through beautiful St George, Utah. I’ve been told it is one of the best organized races in the country. Walt Disney World Goofy’s Challenge – My wife and I have been to DW 7 times since we were married in 1997, so we obviously love the place. The Goofy’s Challenge is to run the 1/2 marathon on Saturday and the full on Sunday. Runners get a Donald Duck medal for the 1/2, a Mickey Mouse medal for the full, and a Goofy Medal if they can complete both. I am registered for the Challenge in 2011 (my wife is registered for the 1/2). Marine Corps. (Washington, DC) – Running through the monuments in DC with Marines handing out water & Gatorade at the aid stations. Sounds pretty special. Would probably register for this year if it didn’t fall on Halloween. I really don’t want to miss Halloween with my kids. 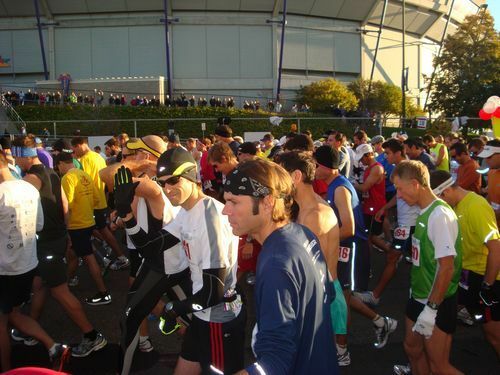 Rock n’ Roll San Diego – The original Rock n’ Roll marathon in the city known for perfect weather. I know that all of the Rock n’ Roll events are incredibly well run, and are BIG! Twin Cities – My friend Mary Anne says this is the most scenic marathon she has ever run, and she has run a LOT of marathons. Starts in Minneapolis and runs to St. Paul. Course passes by numerous lakes, and the Mississippi River. Country Music Marathon (Nashville, TN) – I’ve completed the 1/2 marathon, but never the full. Registered for the full in 3 weeks. Love running through the streets of Nashville. Miami – A flat, sea-level course in beautiful Miami. Finishers get a spinning palm tree medal. P.F. Chang’s Rock n’ Roll Phoenix – I love running in the Phoenix area. Mercedes (Birmingham, AL) – I’m not particularly excited about the course (a double loop), but really want the Mercedes hood ornament medal. Little Rock – Another one that is about the medal. Like having a dinner plate around your neck. Cincinnati Flying Pig – Why? – Two-Sided Flying Pig Medal…. Harpeth Hills Flying Monkey (Nashville, TN) – Basically 2 laps around the main drive in Percy Warner park (1 in each direction). I regularly train in PW park, and to say it is challenging would be an understatement. Each lap has over 3500’ of elevation change. Not certified, not a BQ, but I really want to do this one. Part of it is because it is my home town. Part of it is the beauty of the park. Part of it is the cool, wood, flying monkey medal. Part of it is getting the bragging rights for finishing this brutal course. So what great races are missing from my list?